In the interest of keeping the blog post manageable, I’m not going to include all the questions (what state, fulltime/partime, location, etc. )…But, I am going to discuss the meaty questions. I may follow-up on the others later on (or really work on it and present it somewhere…we’ll see). There were a total of 770 people who participated in the survey. They came from almost all the states and a few provinces. Most states (I haven’t literally gone through and counted) were represented. The lowest number of respondents was 3 (Montana, Wyoming, and a few others) and the highest was 66 (California). 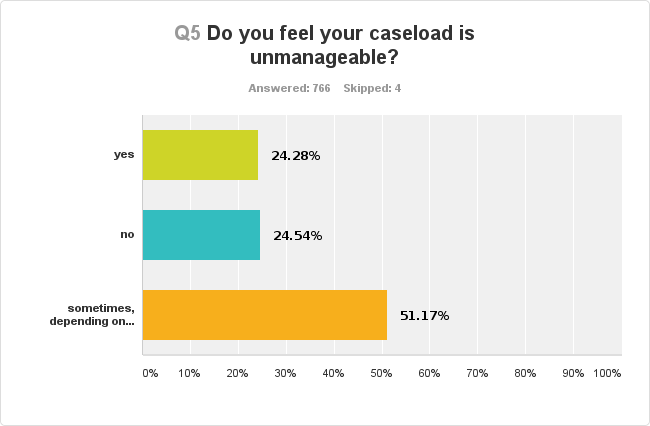 Question: Do you feel your caseload is unmanageable? Question: If you feel your caseload is unmanageable, have you contacted your supervisor? 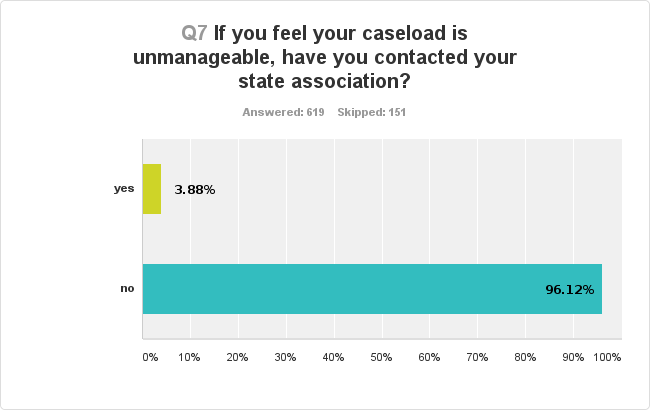 Question: If you feel your caseload is unmanageable, have you contacted your state association? Question: If you feel your caseload is unmanageable, why have you not contacted a supervisor or state association? 440 Respondents (330 skipped). I did and it was fixed = .45% (n=2), Fear of reprisal = 5.68% (n=25), I don’t know how = 6.14% (n=27), I contacted my supervisor and it was resolved = 9.55% (n=42), There’s no use, they won’t listen anyway = 20.68% (n=91), Not applicable my caseload is great = 24.32% (n=107), Other = 33.18% (n=146). 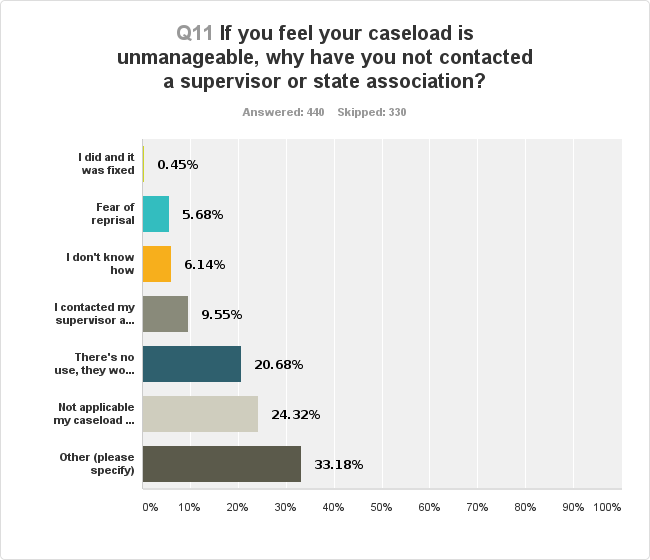 Looking at the pure data, even though it looks as though 75% of SLPs have felt their caseload was unmanageable, only 61% of those have contacted a supervisor to tell them they were unhappy and only 4% have ever contacted a state association. Yet, only 9.5% said their supervisor fixed the problem so they didn’t have to contact the state association. What happened to the rest? For those of you who have not contacted a supervisor or state association, how do you expect things to change? The “powers-that-be” cannot fix what they don’t know is wrong – and we cannot rely on someone else to report it…we have to! Another thing that bothers me is those of you that did not contact a state association because you didn’t know how or were afraid of reprisal if you did. That tells me that state associations need to step up to the plate and advocate for their members. If you have a strong association, members should feel free to contact a representative to discuss issues. Finally, we are constantly told that we cannot use the excuse of “not enough time” as a reason to not have students on our caseloads. It is time that school districts and states quit using the “not enough money” excuse for creating a system designed to fail those who need it most. No matter how skilled we are, if we are over extended we cannot serve our clients as well as they deserve. I am constantly hearing “ASHA doesn’t do enough for school-based SLPs,” and “why should we belong to ASHA they don’t do anything to help.” My standard answer (supported by the data here) is that ASHA can’t fix a problem of which they are unaware. It is time to advocate for ourselves. We MUST be willing to step up and use our voices when things aren’t right. By remaining quiet, we may keep a job we will end up hating, but we are hurting ourselves, our fellow SLPs, and ultimately our clients. We are, in one sense, being unethical in NOT advocating for adequate help for our clients (that stung a bit didn’t it…I’m sorry that it hurt, but I’m not sorry for pointing it out…someone had to say it). For those of you that say it’s no use…I’d like you to check out Rachel Wynn’s post and the attention she has helped draw to unrealistic (and unethical) practices of productivity in skilled nursing facilities. There’s also posts in the ASHA Leader about this subject. Changes are happening because someone had the nerve to stand up and advocate for their clients. One person started it…ONE is all it takes to start. I truly hope that each and every one of you will speak up for yourselves and your fellow SLPs. Contact your state associations to help build caseload caps, report those districts that are not adhering, contact ASHA for additional support. Please, let me know how the battle goes…I truly look forward to hearing ASHA’s answer to ALL of our requests. « Well that was a fun Better Hearing & Speech Month! SLps who say they can’t manage their caseloads at my work which is SELPA(Special Education Local Plan Area) get harassed and they try to fire them. It has become a different place to work since the recession. Money cuts for budgets, teachers fired easily, and just general overall moral. We have fought the fight for more time for our students. I have had to personally stand up to my boss and tell her that you can’t group such severe students and she did listen. We as group feel that in general that our boss doesn’t care and in general doesn’t want to listen. We brought the union Rep to our caseload meeting to insure that everything went well and that did help. The issue of unmanageable caseloads has long plagued our school-based members, and we at ASHA are well aware of our members’ concerns. After years of adhering to a specific recommended number as the optimum caseload, we recognized the fallacy in this approach. It was apparent that caseloads were not reduced and states and districts were not buying into the ideal number concept. In addition there was no evidence based research to support the specific recommended number. 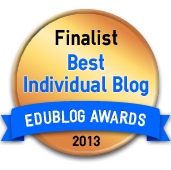 And according to IDEA, services should be determined on an individualized basis. Then ASHA summoned a group of school-based members to come together to develop a new method for determining the appropriate number of students on a school-based caseload. This method, the workload approach, was published in 2002. The Workload Approach to Determine Caseload requires a careful analysis of federal, state, and local requirements for each student in addition to treatment time for each student. When these many factors are included in the mix, appropriate caseloads can be determined. Find the ASHA Workload Portal on http://www.asha.org and search workload/caseload portal for a complete description of this process as well as suggestions for self-advocacy. ASHA has established a new school issues committee which plans to address the caseload issue again along with other relevant school practice issues. They would welcome member input. You can send your suggestions to Deborah Dixon, ASHA’s Director of School Services, ddixon@asha.org. All districts have not embraced the workload concept. However there are many that have. You can find examples of workload success stories at http://www.asha.org Search “School District Success Stories.” Members who have posted their stories are willing and eager to help others who are in need. You may contact these members directly. In addition to individual efforts to manage the caseload problem, it’s necessary to advocate at the state and district level. ASHA’s State Advocacy Team works with states to resolve issues. Eileen Crowe, ecrowe@asha.org is your contact at ASHA for guidance in this and other state related matters. Thank you for your reply Roseanne. I agree wholeheartedly, we have to try to make a change at the district and state levels. ASHA is not a legislative body – it cannot enforce change within the states. I think a big part of the problem is that so many people expect ASHA to fix it – but they refuse to, or are unable to, contact their state associations (for whatever reason). Unfortunately, a discussion I had on twitter last night really highlighted the negative viewpoint many SLPs apparently have toward ASHA and their state associations. I’m not sure how best to help make that different. If people are unwilling to become active – to speak up – and make a difference, what can we do? For those who are trying to make a difference – if the school district refuses to go to the workload model – what can the SLP do? What recourse do they have besides walking away from their position? If the state association refuses to act, what can the SLP do? Thank you for the contact information for everyone…I appreciate it and I’m hopeful that some of my readers will act on it. Thank you. I truly hope people will utilize the links you’ve provided and start speaking up at a state level. Recent discussion on twitter and Facebook has shown that the perception of many SLPs is that ASHA doesn’t care about school-based SLPs and has “turned a blind-eye” toward problems. I was pleased to read your response here indicating that ASHA hasn’t turned a blind eye and has offering suggestions for how to correct things. It’s unfortunate that the situation has gone on for SO long without getting better. I know of many SLPs that have left the field because of burn-out due to high caseloads, paperwork, etc. While others are saying they can’t fix the problem due to lack of applicants, budgets, etc. I don’t know what the answer is – but I’m hopeful that things can be corrected.